Bioactive Herps Plant Boost is an all natural fertiliser, derived from Black Soldier Fly Larvae Frass and Bio Char. BSFL Frass is a 100% natural and sustainable byproduct of Insect farming that does not damage the environment like Volcanic Rock Dust or Seaweed fertilisers. BSFL Frass contains Nitrogen, Phosphorous and Potassium (NPK) in ideal amounts for a wide variety of different plants growth. It also contains Chitin from the shed exoskeletons of the BSF Larvae, which help bind micronutrients, such as Calcium, Iron and Magnesium, to improve the plants uptake of these vital nutrients. 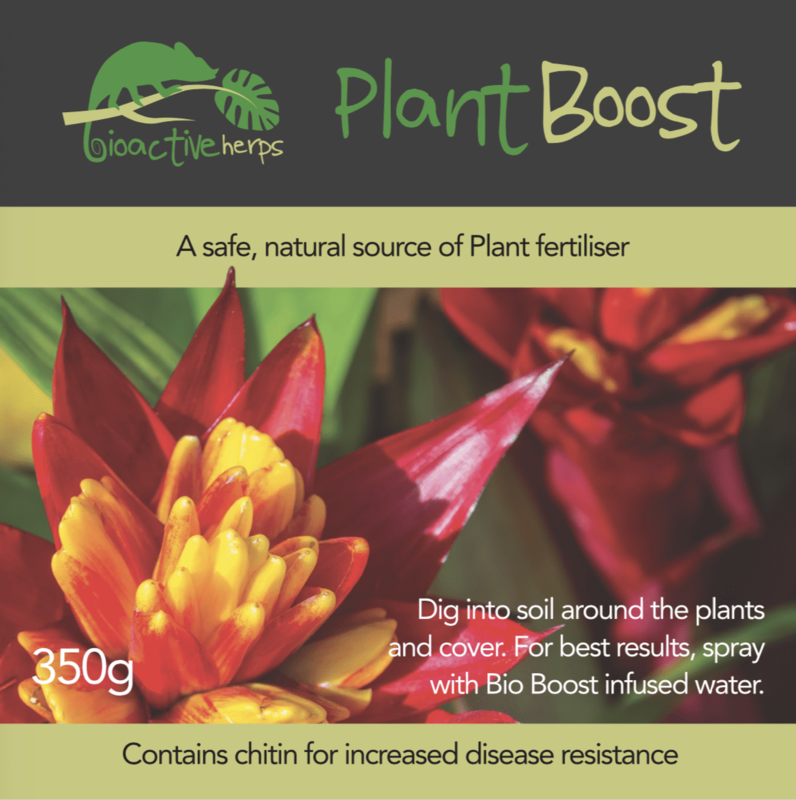 Chitin also helps encourage the plant to grow stronger, by initiating its natural immune system and defence mechanisms. The reasoning behind this is currently under investigation, but it is believed that the presence of Chitin causes the plant the believe it is under attack from pests. This makes the plant release its natural defence mechanisms and improves overall health. BSFL Frass also contains a range of Nitrogen Fixing Bacteria which, when used alongside Bioactive Herps Bio Boost, pulls Nitrogen from the atmosphere for use by the plants. Bio Char has been used for thousands of years by humans for improving soil fertility. Bio Char is a highly porous, high carbon form of charcoal that naturally helps to improve soil fertility, soil structure and plant health. Thanks to its honeycomb like structure, Bio Char supports microbial life which is beneficial to plant health and also the bioactive system as a whole. Bioactive Herps Plant Boost is best used in conjunction with Bioactive Herps Bio Boost.